Strange Music is pleased to announce Tech N9ne’s It Goes Up Tour 2019! Featuring Tech N9ne with special guests Dax, Krizz Kaliko, ¡Mayday! and UBI of Ces Cru, Tech N9ne’s It Goes Up Tour 2019 is sure to be the most exciting tour of the year. We’re offering a VIP package with OVER $450 IN MERCHANDISE along with an artist Meet & Greet and a ticket to the show of your choice. Don’t miss your chance to experience Tech N9ne’s It Goes Up Tour 2019 like a VIP. Keep in mind, there’s a limited number of VIP packages per show – so don’t wait to get yours! Head over to strangevip.com for more information and to select the show you want to attend – keep checking back as we add more shows – get your VIP package of merchandise and an artist Meet & Greet. 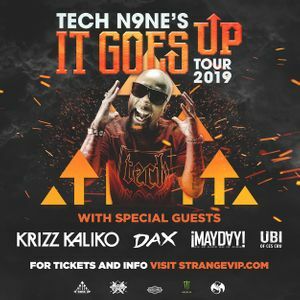 Click here and experience Tech N9ne’s It Goes Up Tour 2019 VIP style!